There is no question that Lance Armstrong is the biggest name in competitive cycling in North America. He dominated the sport for years and rode his way to numerous championships, broke records, and made the west pay close attention to the Tour De France. In 1999, he was named ABC Wide World of Sports Athlete of the Year, and was Alternative Press’ Male Athlete of the Year from 2002 until 2005. Amidst his success and accomplishments, his most acknowledged and admirable attribute is that he has helped inspire millions of people facing deadly diseases such as cancer. In 1996 at the age of 25, Armstrong was diagnosed with testicular cancer. To make matters even worse, the tumor spread to other vital organs such as his brain and lungs. Following the news of his cancer, he immediately underwent treatment including brain and testicular surgery, along side extensive chemotherapy. With the initial prognosis on his state being very poor, Armstrong showed just how strong of a fighter he was by not only overcoming the cancer and the extensive wear and tear it had on his body, but he returned to competitive cycling. 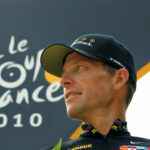 Nearly a year after his return to cycling, Lance began his dominance over the Tour De France as he won seven straight times from 1999 until 2005, when he announced his initial retirement from the sport. Although his ability to comeback after facing such an experience is phenomenal in its own right, what is even more heroic is the fact that during his treatment for cancer he lent his hand to others battling the same disease and founded the Lance Armstrong Foundation. The purpose of the Foundation was to assist and support the millions of people who are faced with cancer in all of its shapes and forms. Since its inception in 1997, the Lance Armstrong Foundation has aimed to empower and inspire cancer patients and their families by providing practical information and the proper tools for patients through public health care and in-depth research. Through various charity events and causes such as the Livestrongcampaign, the Foundation has raised over $325 million from sales of the infamous yellow Livestrong bracelets and events such as the Livestrong Challenge. It has also become one of the Top 10 cancer funding charities in the United States, and a significant symbol in pop culture. In 2008, Lance Armstrong announced that he personally would donate a total of $5 million over a 5-year span, in turn putting his money where his mouth is. He was also a part of a group consisting of 11 other high profiled athletes that started the Athletes for Hope charity. The group of 12 consisted of athletes such as Muhammad Ali, Mia Hamm, Tony Hawk and Mario Lemieux to name a few. Athletes for Hope helps connect professional athletes with various charitable causes and inspires others to help and support their communities. In August 2009, Armstrong participated and headlined the first charity ride, Pelotonia, which took place in Columbus, Ohio. The ride was over 100 miles and featured a large group of cyclists, whom were personally addressed by Armstrong himself before the two-day venture. Like everything else Lance takes part in, the ride eventually raised millions of dollars towards further cancer research. Lance Armstrong has inspired millions of people, cancer survivors or not, to become pro active in raising money and awareness for cancer research and treatment. Through causes such as the Livestrong bracelets, he has helped bring the fight into the mainstream and has brought hope to millions. Every person that takes part in his Foundation’s events and causes have matched his personal hope and goals. The fight is far from over, but with the continuing support of various communities and with role models like Lance Armstrong, the fight will hopefully one day come to an end.